An early Little Golden Book and a collector's favorite, I managed to buy this at a thrift shop for 49 cents last year. It's not in the best condition, but it's a perfect reading copy and that's good enough for us. And what fun it is. 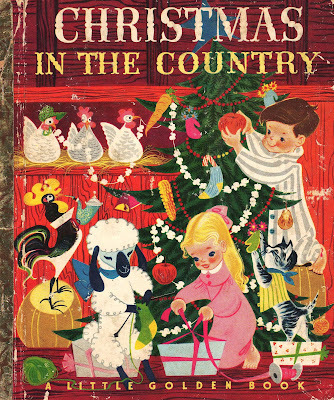 When Betty and Bob go with their folks to their grandparents for the holidays, it definately makes for a country Christmas. 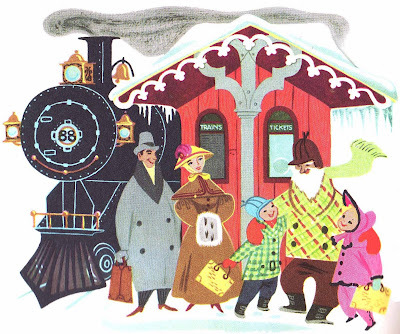 I mean really, who wouldn't want to be fetched from the train station by a horse-drawn sleigh? All the classic Christmas traditions are here. Setting off to cut down the tree. Stringing cranberries in front of the wood burning stove. Carols by the old organ. 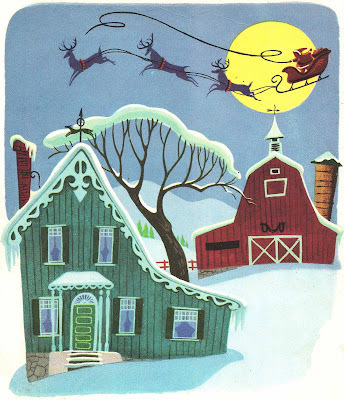 And the best part, a seasonal bedtime story drawn into life. "Grandmother," Bob asked, when he was ready to be tucked in bed, "is everyone in the world getting ready for Christmas the way we are?" "Everyone," Grandmother assured him. "Why I dare say over in the barn at this very moment even animals are getting ready for Christmas. 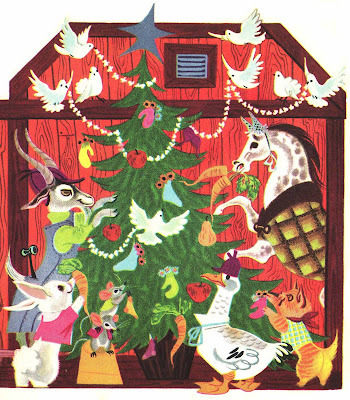 Perhaps they're having a tree of their own, and of course, the hens would be making corn garlands for it, just as Betty made her cranberry chain. And who'd do better at trimming the tree than the pigeons who live in the loft? The magical fantasy goes on for a few pages. The pigs do the baking. 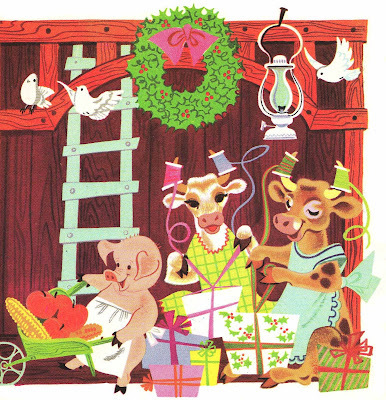 The cows wraps the presents. 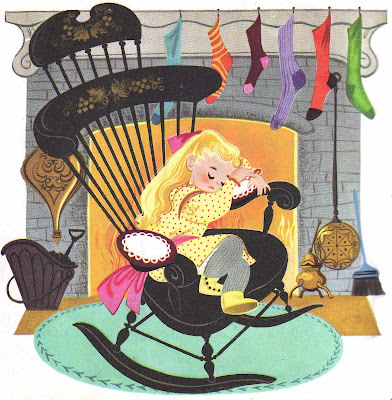 And the lambs knit the stockings (with their own wool of course!) 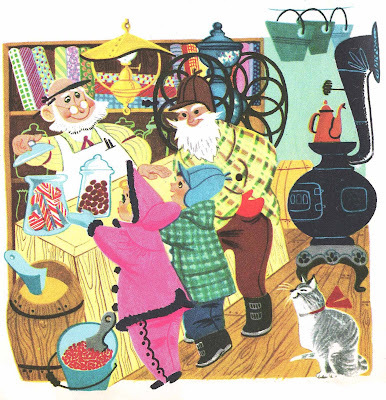 A funny and snuggly story for the beginning of a long winter night. See full scans of the book on the wonderful blog Golden Gems. Darling. Love charming Little Golden Books!!!!! Thank you for the link back to last year's post at Golden Gems. We had fun reading it! Grammy says, I grew up with this book and would love a copy for my Grandchildren!!!! I love it to this day! !